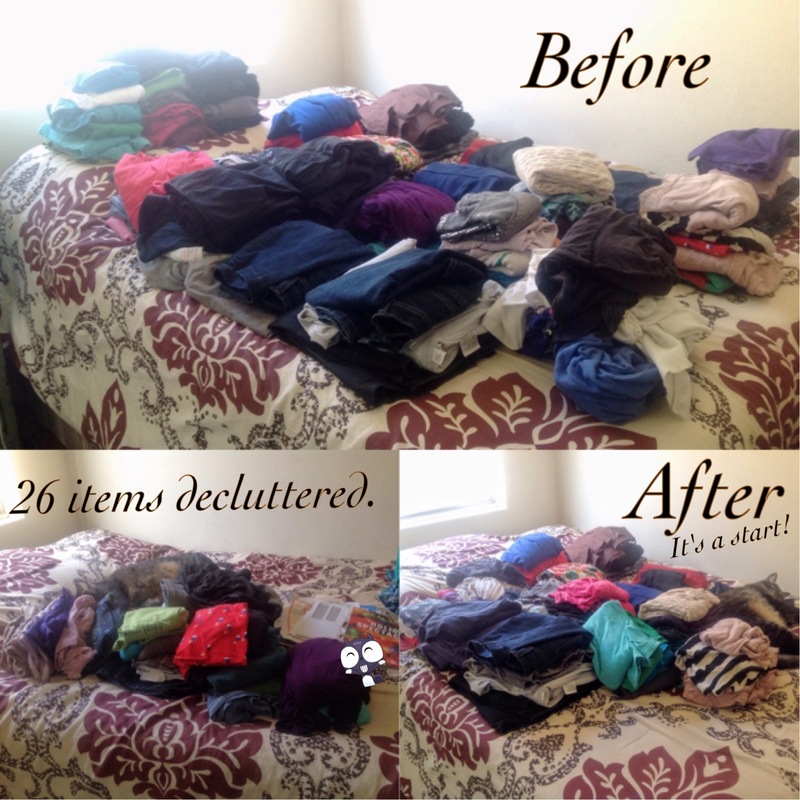 blog.sweetlovetruly: SDD Clutter Free Day 5: What is a reasonable wardrobe? SDD Clutter Free Day 5: What is a reasonable wardrobe? 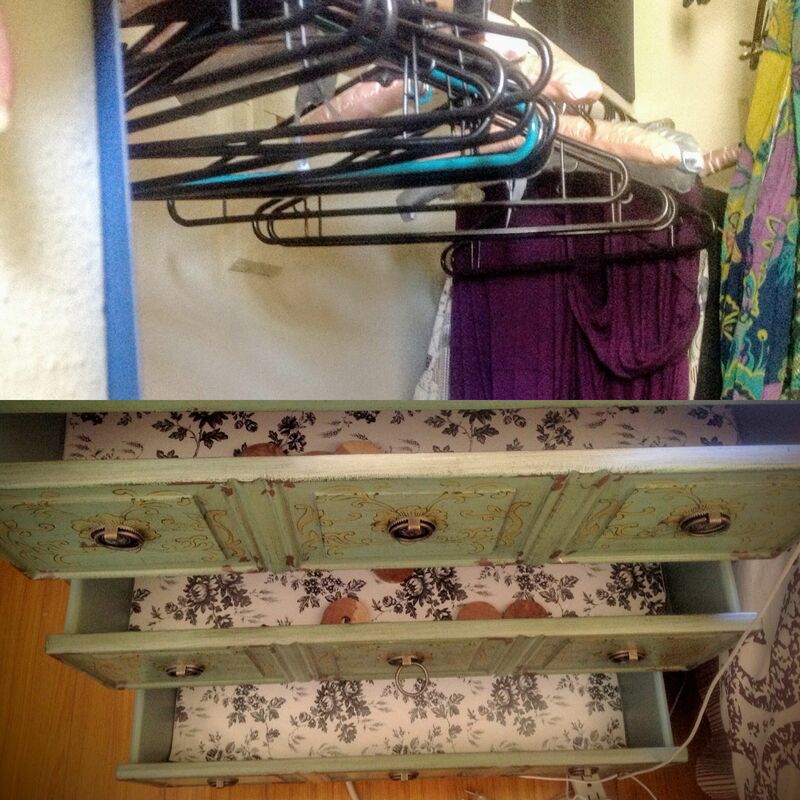 Today I made a special project out of decluttering my wardrobe. It's Day 5 of the So Damn Domestic Clutter Free Countdown, which means 26 items gotsta go. I thought about scavenging for miscellaneous items again, but something called me to tackle the clothes. Clothing comes up often as a topic for minimalist writers and podcasters, so my recent forage into "minimalism" and "simple living" resources must have planted the seed of wardrobe decluttering in my head. Wow, lotta nature verbs today. I left outerwear for another day. and dresser. I stacked them in categorized piles on my bed. Then I scratched my head for half an hour. I've heard the first step is to get rid of clothes I don't wear, but that was only a few items. I manage to rotate through the bulk of them by not doing laundry very often. I'd rather not do that, though. I'd rather have less stuff and care for it in small, frequent bursts, than have to spend all day doing laundry once a month because so much has piled up. I set out looking for quantifiers, some numbers to define how much I should have. I sensed in my use of "should" that I wouldn't get the answer I wanted. Sure enough, most research and responses from friends and co-declutterers were, "Whatever works for you is what's right!" Shoulds are always trouble. So frustrating, right? I wanted hard data! 3 pajama outfits, 4 dressy casual outfits, that kind of thing. The one article I found that counted outfits proved why it's a useless exercise: her numbers didn't apply to me at all. I don't need a set of church clothes, and a no sweatpants rule? Preposterous. Tyrone slept in the keep pile AND the declutter pile. Mixed messages. 6 casual bottoms (2 pairs of jeans, 2 capri pants, 1 skirt, 1 pair of shorts). 3 sweatpants (2 pants, 1 shorts). Notice this number is not zero, because I'm normal. 3 nightgowns/nightshirts, whatever you wanna call them. 11 t-shirts. I have a feeling this number will shrink by Day 30. Total: 48 items in wardrobe. Not exactly minimalist, but a good start, I think! Pro tip: If you do this, remember to count the clothes you're wearing. 6 sweats, PJs, workout pants. Total: 5 items whose fate is undecided. I'm going to tuck them away until the end of the month and see if I miss them. I also decluttered yet another magazine and yet another stack of papers, bringing my total to 27. But we'll call it 26, because close enough. How did I decide what goes? -If everything's clean, I don't choose it first. These are the items I settle on when the stuff I really like is dirty. -It has holes or is threadbare. -It's frumpy or doesn't bring me joy. I think I was still quantifying a little as I went through the piles, but there was no rule about it. I thought of it like, "Something to wear, something to wash." How many of this type of item do I need until the next wash cycle? I wear the same nightgown every night for a week, or at least close to a week, so three might actually be generous. Same with sweatpants, which I wear in the evenings. Just those two categories helped me clear out a lot. It's true what the bloggers and my friends say, though: It's all about what works for you. Sigh.